Beginning May 2nd and 3rd, the Sky Trail® Wisconsin Adventure Zone will open at the Zoo and run weekends only until daily operations begin May 23rd to September 7th. Sky Trail® Wisconsin Adventure Zone features a Sky Trail® Explorer ropes courses that stand 45-feet tall with 3 levels of horizontally strung obstacles such as zig-zag beams, cargo nets, rope ladders, and more. Participants travel at their own pace in any direction they choose. This course requires a 48-inch minimum height to participate alone, however adventurers 42-inches or higher may participate with an adult. Continue the adventure on the CTS Zip Line that provides an exhilarating experience in the open sky. Participants zip nearly 500-feet at treetop level to see the Milwaukee County Zoo from a whole new perspective. 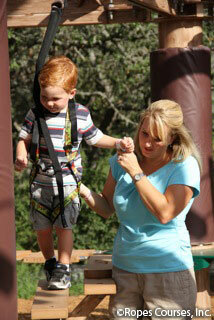 The attraction also features a specially designed ropes course for the really young adventurers, too! The Sky Tykes™ ropes course is a scaled down version of the full-size course for children ages 2-7, or less than 48-inches tall. The platforms are less than 3-feet off the ground. The open course design allows for easy parent participation for any level of assistance needed. Parents can walk alongside their child or simply step back to watch. May, September & October: Open weekends only – 10 a.m.-4:30 p.m.
Memorial Day-Labor Day: Open 7 days a week 10 a.m.-4:30 p.m.